FIDE President Arkady Dvorkovich awards GM Wang Hao on his victory. 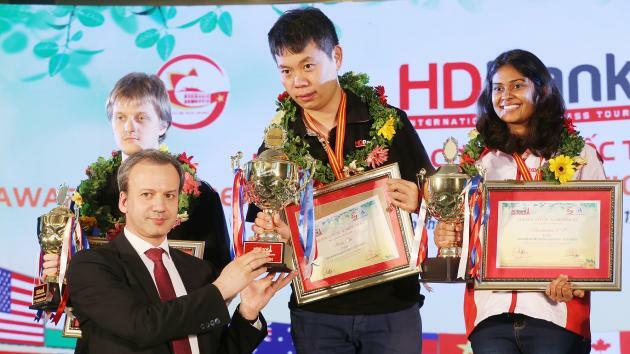 Top seed GM Wang Hao of China stamped his authority on the HD Bank International Masters 2019 in Ho Chi Minh City, Vietnam to win yet another GM open in Asia. The HD Bank International is already into its ninth edition since its inception in 2011 and has established itself as one of the strongest opens of Asia. This event was a nine-round Swiss-system for players with a 2000 rating or more and featured a staggering prize fund of USD $60,000. The tournament was held March 6-14, 2019 at the luxurious five star Rex Hotel in Ho Chi Minh City, Vietnam. Every year, The organizers oscillate the event between Vietnam's two biggest cities, Ho Chi Minh City and Hanoi. 151 players from 23 countries participated, 109 of whom were titled, including 25 grandmasters. As a participant myself, I can say that the organization was top class and the event was well marketed with banners and billboards of the tournament all across the city. The opening ceremony was a colorful affair. They organizers left no stone unturned and were very hospitable. Apart from the conditions offered to GMs & WGMs, they also gave away two t-shirts and a jacket sporting the tournament's name. They also offered a selection of cakes, cookies, biscuits and freshly cut fruits with tea or coffee for all the rounds. This was followed by a gift and a gala dinner for the all players. The second day of the event was International Women's Day. As WGM Irina Bulmaga noted on her Facebook page, the organizers presented a flower and an additional gift to all the female players playing. Ukrainian GM Stanislav Bogdanovich, a man in form, stormed into an early lead with an impressive 6.5/7. He beat last year's defending champion GM Sandro Mareco of Argentina in round seven by trapping Black's queen in the middle of the board! FIDE President Arkady Dvorkovich attended the closing ceremony from where he also started his long Asian tour. | Photo: HD Bank Team/HD Bank Chess. Every open Swiss is an ideal event for norm seekers and this one was no different. Five players scored international title norms. Chinese players IM Liu Guanchu and Xu Minghui scored GM norms while FM Azarya Jodi Setyaki made an IM norm. Indian prodigy Gukesh D was fortunate in some of the games but played exceptionally to finish with 7/9 and tie for second place. He scored an exact 2700 performance rating and gained 19 Elo points to his existing rating of 2529. He got his title updated to GM by FIDE on the last day of the event. It's clear Gukesh is progressing rapidly after becoming a grandmaster earlier this year!